As the name suggests, the Hot Wheels Car maker help kids make their very own vehicles in a matter of minutes. 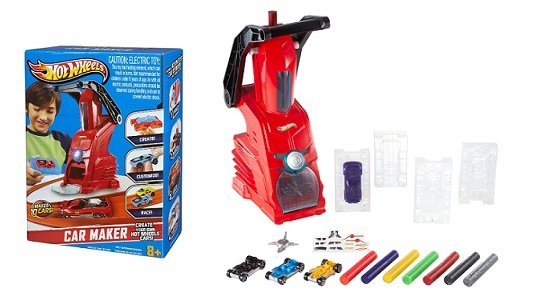 The unique hot machine turns a stick of wax into a fully functioning hot wheels car that kids can customize with decals. This innovative machine features cool lights, music and voice prompts that help kids create their own masterpiece. Simply heat up the machine, select a mold and wax color stick and start creating your own car. In an about 8 minutes the Car maker melts the wax into the mold and cools off creating your own car design. Later start decorating your car with cool decals from the sticker pack. You very own car is now ready for racing action. Not only the Car Maker creates the masterpiece but talks to the young car designers through each phase of the process. Once you are done with your speedy flames or sleek graphics decoration, you have a brand new custom car ready to take off to the races in all about eight minutes. You can purchase additional car making materials with refill packs designed for the hot wheel car makers that are available saperatley.